It was Archaellys’ birthday not that long ago and somehow I forgot to post the coordinating movie night nom for that celebration. Oops. I don’t know how it happened, but the week must have gotten away from me. It’s always kind of my thing to let the birthday celebrant pick whatever they want and I’ll make it happen. 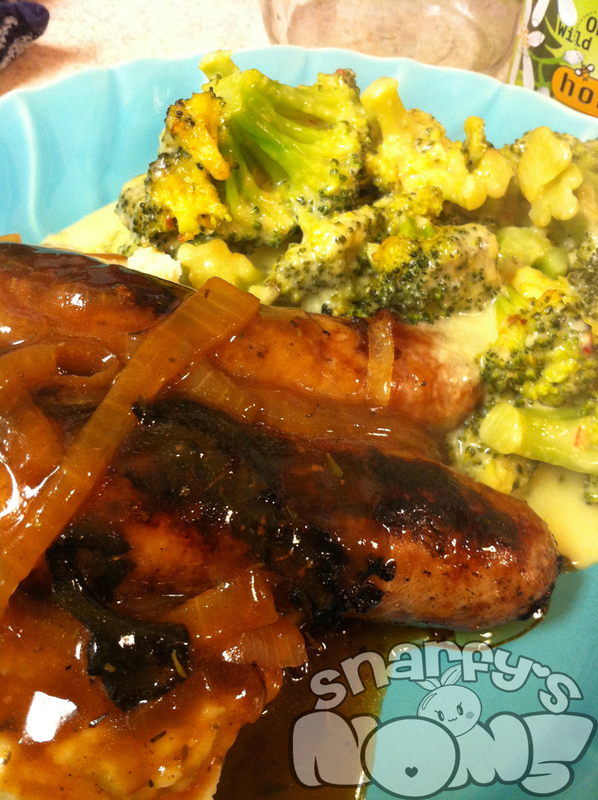 Arc happened to pick bangers and mash with some cheesy broccoli as an extra side. I was more than happy to oblige the birthday boy. Now bangers can technically be any sausage you like. At least my research tells me that. So I used bratwurst that I picked up at Trader Joe’s, and let me tell you, those are some good brats. It’s more about how you cook them. Instead of the usual beer-onion bath for the brats, I pan fried them (on a bed of onions for good measure). That’s pretty simple to do and I don’t think it really requires me to spell it all out in a recipe. If you have questions though, feel free to throw them in the comments. My research lied and I kind of knew it, but finding actual bangers in the store around here is pretty hard until recently apparently when packages of bangers showed up in my local grocery store. Bangers do exist for reals, but I still sub out bratwurst sometimes because it’s freaking bratwurst and waaaaay easier to come across around here. Mashed potatoes are easy, and I used my usual recipe. Keeping with that past post link right there, I made that gravy, but with a shitton of sauteed onions in it. OMG, so good. When I plated it all up, I put a bed of mashed potatoes down on the plate, nestled those brats into the spuds, and covered the whole thing in a good helping of gravy. Now… the cheesy broccoli… here’s that recipe…. In a saucepan, melt the butter and add the corn starch. Whisk in the ground mustard and then add the milk. Once everything is incorporated, add the cheese and mix until melted. I’ll be honest, I usually end up doubling the cheese, so my 2 cups of shredded cheese was more like 4. Adjust your milk and thickener as necessary if needed. Mix the cheese sauce with your steamed broccoli and enjoy! You could transfer everything to an oven safe dish and pop it in the oven for a bit to crisp up the top. You could even top it with some breadcrumbs before you do that if you’re not gluten free. Me? I’d top it with more cheese. This might sound a little weird, but if you have leftover cheesy broccoli the next day, throw some in a pan and mash it up a little. Then add a scrambled egg and cook. Eat those cheesy broccoli eggs with a little barbeque sauce. Seriously, trust me, it’s amazing.